I find my cash flow spreadsheet, for both my personal life and my business life my most comforting foundation. Even when they are scary. Today, my thoughts woke on this subject as it is where I turn when I want to be sure my family and my business are on the right track. When you are investing heavily in a business, you have to stay on top of this. My cash flow is projected out for two years, this is the period for which I want to see the tax provisions and the flow of cash for the business and the impact the cash coming in and the cash going out will have. To me, cash flow is KING and QUEEN of business. It enables you to have a complete view of reality and enables the right decisions and the ability to invest in the business and focus on ensuring the income meets the needs for growth and investment in resources. If you are personally investing in your business, linking the two is critical, our business expenditure is linked to the business, as one is supporting the other and therefore the impact is enormous on our personal life. I think this is true of all start-ups and also true of sole traders and small business. I am not sure how many people really understand cash flow. I think if more business owners did they would be much more on top of the payment terms for both their clients and their suppliers. Fast cash into the business and slower cash out can make all the difference between success and failure. It can overcome months when income is slower and can enable a view going forward that takes the fear out of the future. It is also so important to teach this to our children, this is not taught at schools (to my knowledge). When my children went to University, they had the first experience of lumps of money entering their bank account each term and then the monthly rent and costs that would leave it, creating a budget and enabling them to see the year ahead helped them to invest in books without fear, pay their rent and also have the fun they want without worrying that they will run out, so long as they kept to their ‘entertainment’ and clothes budget. No matter how small the sums are, cash flow knowledge and management of the numbers running though the business is a critical component of business, however, it is not taught when we start our first business, it seems that, if people are lucky, this skill is past on from friends, and perhaps a good accountant would help a client set one up. They are so personal and individual, I think it needs to be set up and managed with real understanding. So today, if you don’t have one, and few do in my experience, can I suggest you look into this. If there are any members out there will to help anyone, can you put your hands up. Perhaps a shared skype session could be arranged. 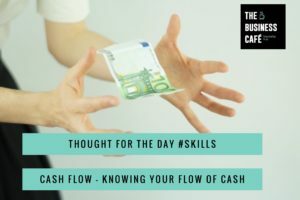 If you don’t have a cash flow spreadsheet set up, please know that you are in very good company, but lets get this sorted for you. Any thoughts from you all on your journey with this subject?